is it better to pull the hot air out the enclousure? of is it better to blow the cool air over the heatsink and into the elclousure? You have a good way of directing the flow of air you are pushing in. In my MaxPro I rackmount enclosure I have two 40 mm fans at the rear of the enclosure and perforations on the side next to the exciter. 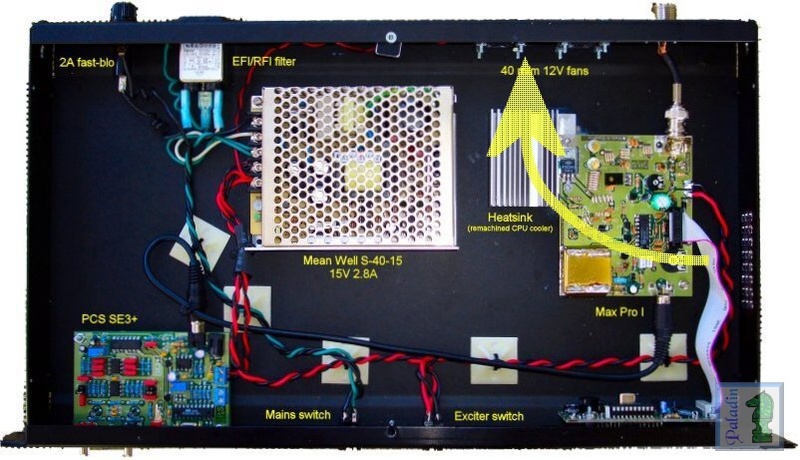 The airflow is more or less as depicted by the yellow arrow, there are also perforations in the top cover over the power supply so that air is drawn in and down through the p/s as well. With high power units I prefer to have fan blow directly into the hot spot. When dealing with a heat generating sources within an enclosure I tend to prefer to pull the heat out, with make up air being delivered through strategically placed louvers/perforations/etc. I don't know that it makes any difference with the levels of heat we're talking about here, however the basic goal with enclosures remains to get the heat out. With larger industrial cabinets we were taught that "blowing" pushes the heat generated by the fan drive into the cabinet, but that "sucking" discharges the fan drive heat directly.